Whew. Now this was a Project, capital P and all. This was one of those projects that feels a bit like climbing a mountain or running a marathon. For a long time, you can't quite see where the finish line is and you have to stop thinking about it or you'll get too frustrated. One foot in front of another is the way to go. And even when you can start to see the finish line, it takes a long while longer to actually cross it - like the peak of a mountain can seem much closer than it actually is. But when you arrive? When the last stitch is sewn? Ahh, you are rewarded with such a sense of accomplishment. I need the quickie-jersey-top-done-in-two-hour projects as much as the next sewist, but I glow for days when I finish one of these challenges (and because I'm a little bit crazy, this one was a twofer). A year after the wedding, K brought the dress back so it could be shortened to cocktail length. 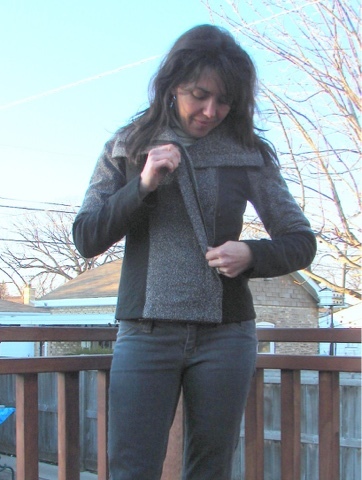 A year later after that, K had me use the remaining bits and pieces along with leather to create the jacket using Style Arc's Jett Biker pattern. I think this will be the end of the line, since there are very few pieces left (I had to piece together the front panels as I didn't have anything big enough - the lace pretty well hides the seam). The leftover scraps from the dress and three lamb skins (from GorgeousFabrics.com - still in stock) fit in a quart size ziploc bag. What made this such a challenge? Let me tell you! It started with a muslin so that I could check fit and practice some of the steps. The fit was perfect out of the box and I'm close enough in size to my client that it fit me, too (bonus!). This is where easy ended. The sheer number of pattern pieces was part of the challenge here. Each sleeve alone was comprised of five pieces (although the lining only had three). 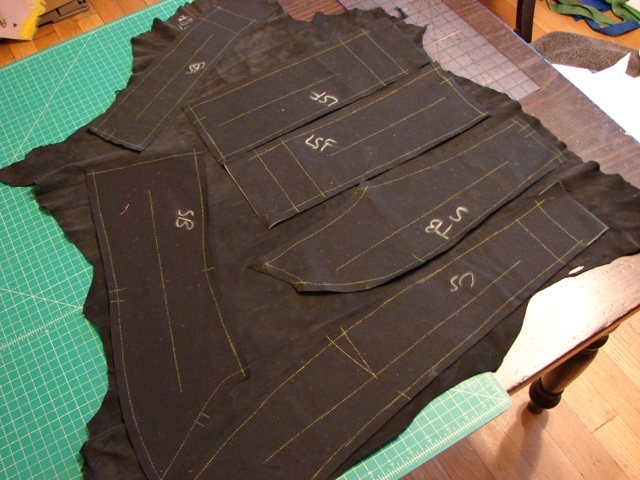 If I'm counting correctly, the outer layer was made up of 19 pieces while the lining involved another 15. Then I decided that everything needed to be underlined (I used twill for K's jacket because it needed a lot more body and cotton batiste for mine) so for each jacket I had to cut out 53 pieces of fabric. I just added that up right now (106 total!) and I'm no longer surprised that it took me two full days just to cut and mark all those pieces! Trying to cram as many pieces as possible onto one of the skins. I decided to go full couture so I hand-basted the underlining to the main fabric. I have no idea how long this took me, except that I watched a season of Broadchurch and a few Miss Fisher's Mysteries while I worked my way through the 27 pieces that needed be be underlined (the leather pieces I basted with glue, so they went quickly). My eyes and fingers were sore by the end. At this point the meticulous side of my personality was in full reign so I decided that every seam needed to be top stitched with a double strand of thread, so each seam was sewn three times. You can't even see the second set of top stitching but I know it's there. 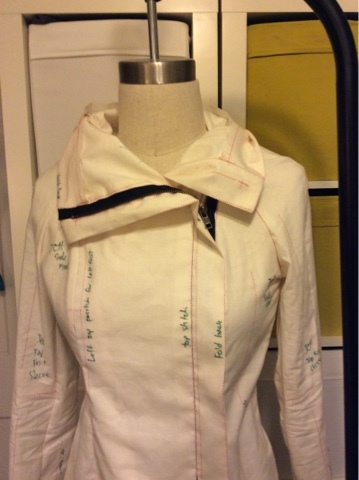 The construction process was tricky, but luckily The Clothing Engineer has sewn this pattern and provided guidance through her own blog and on Style Arc's website (see links). If you ever get stuck on a StyleArc pattern, check to see if TCE has help for you. The lovely thing about Style Arc patterns is that once you know what to do, everything comes together neatly because the patterns are so well drafted. 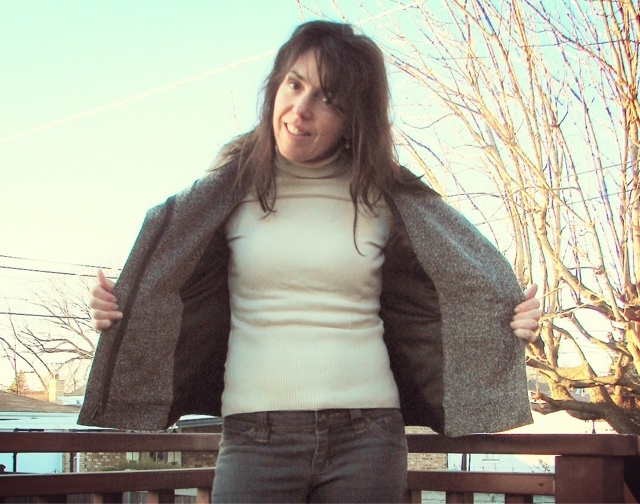 The only change I made was to add a hidden pocket in the inside, since the jacket has no pockets and I was afraid that adding them on the outside would mess with the very fitted design. I'm such a bad blogger that I didn't take very many pictures of my client's jacket - my giddiness fogged my mind. But I have some of the one I made myself. The are almost the same in terms of main/contrast fabric. I used a stretch cotton matellasse for the black parts and a wool suiting for the black/light pink parts, both from GorgeousFabrics.com (sorry, both out-of-stock). 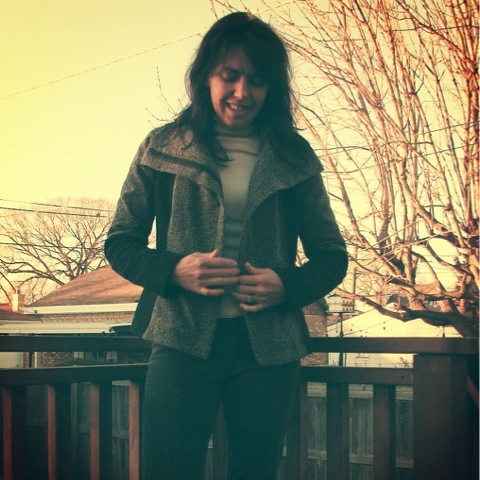 I have worn my jacket almost every day since I finished and my client seemed equally pleased with hers. Oh, and those jeans I'm wearing? 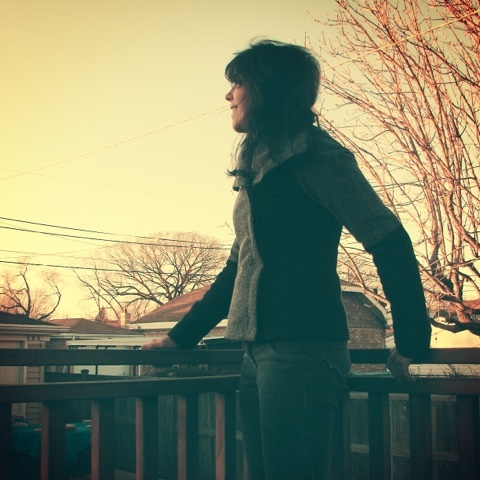 They are the Angela Woolf Angel Boot Cut jeans I made last spring - they've gotten tons of wear this fall, too! Next up I've got some Christmas sewing to finish before I tackle my next big project, a winter coat. And I have another wedding dress order, so I have more mountains to climb in the new year! What about you? I'd love to hear about your latest sewing accomplishment (and feel free to post links to said accomplishment in the comments). 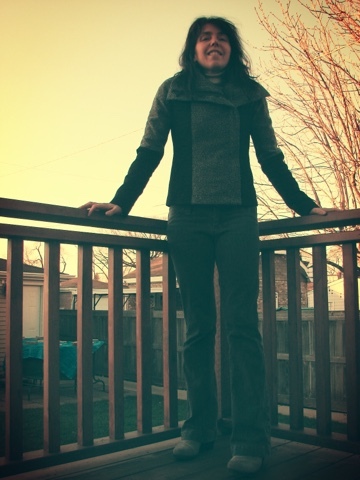 7 comments on "Wedding Dress to Biker Jacket Refashion"
Wow, blogger is really messing with my photos. I probably confused it by starting in the Blogger app on an iPad and then finishing it on a computer. Anyone else have this problem and know how to fix it? Amazing, Lisa!! I love it so much that your client got such great mileage out of her wedding dress. 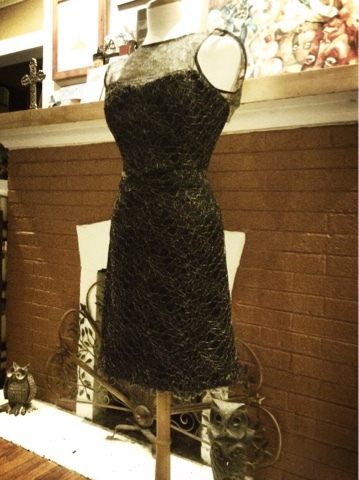 Each piece you made her (and yourself) is just gorgeous. I am super impressed with your topstitching too. Excellent work all around. But I have to say I'm shocked that you sewed through Broadchurch ;-) It's one of the very few shows I watch doing absolutely nothing with my hands, because I don't want to miss a single second of the beautiful photography. It was a little distracting to try to sew and watch at the same time - there's a good chance it took longer because I kept looking up! The main attraction for me was listening to David Tennant's Scottish accent, and I could do that with my eyes closed! I hope you charged a fortune for this gorgeous jacket! I don't think I could have let it go! Thanks, Justine! I was well-compensated which makes the letting go a little easier, and this client is a joy to sew for. One of the things I like about custom sewing is that I get to know such lovely people. Thanks for stopping by! Oh wow! This is so fantastic!! I can't believe all the reiterations her wedding dress went through. 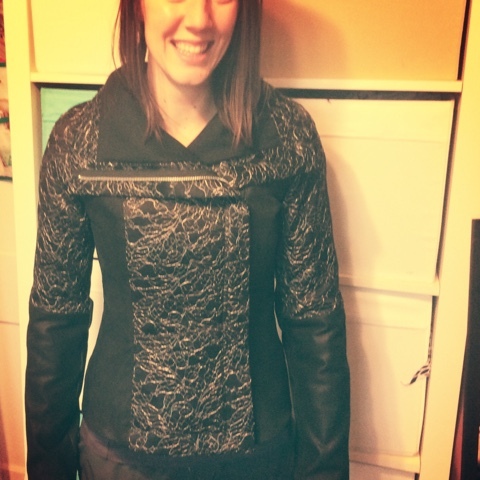 The finished biker jacket is so rad! Well done!